FENDI returns again with its playful outlook on fashion by reinventing one of the most popular emblems of the Eighties amongst sportswear fans: the FILA logo. The Italian luxury fashion house tapped on the talents of Instagram artist @hey_reilly to create visuals that come to us completely new, giving birth to an astounding Capsule Collection called FENDI MANIA. Pieces from the collection deliver a fun option no matter the age, truly becoming cult products that merge luxury fashion with an icon of sportswear. 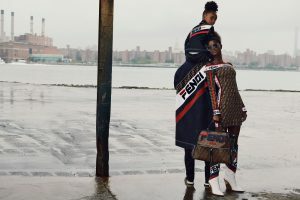 Putting the mania in logomania, the exuberance of the FENDI identity is splattered across waistbands and puffer coats. Stars and fringe exude a Western vibe while also giving us a superhero aesthetic, two on-trend elements we can totally get behind. As we can expect with FENDI, craftsmanship is unbeatable with this dynamic and high-spirited collection. FENDI MANIA hits stores today on the 16th of October, offering a diverse collection of ready-to-wear, shoes and accessories for not only women and men but for the kids as well. We’re ready to strut our stuff in the versatile looks.